THE Guardia Civil has arrested a woman in Spain for the alleged crime of animal abuse after her dog was found hanged in the courtyard of her home. Local sources claim the woman kept “another six dogs living under deplorable conditions”, which the Guardia Civil has taken action to remove from the woman’s home. 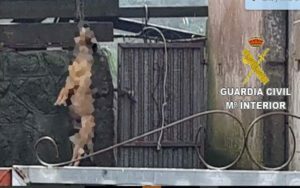 The SEPRONA division of the Guardia Civil in A Coruña, northern Spain worked with Local Police to arrest the woman on animal abuse charges after Local Police officers discovered a dog hanged in the back garden of a house. The woman will face trial for the aforementioned charges in Court of Instruction No. 2 in Corcubión, Spain. The Guardia Civil released upsetting images of the hanged dog after it was discovered by Local Police officers.